This is a model-specific product. Please make sure that you check your tablet model first before purchase. This product will not fit models not listed in the product page. To check your model, please visit device > settings > about/info or check the back of your device. During the next steps, make sure that you do not touch the screen or glass or let dust/lint get in between. Step 2: Hold onto the sides of the protector; peel the clear sheet off revealing the adhesive sides of the glass. Make sure not to touch the adhesive side of the protector. Align the bottom (or top) of the glass with your display and lay down gently. Make sure that the protector is aligned properly before continuing. Step 3: Gently press the center of the glass and slide your finger along the center of your device and the adhesive will spread out evenly. This is important to prevent air bubbles forming from the center. Please make sure that the adhesive adheres completely on to the screen of your device. Step 4: If any bubbles remain, you can use a soft lint-free cloth and push the bubble towards the edge of the glass. If there are lint and dust, repeat step 1. If there are bubbles, you can also gently lift one corner (closest to the air bubble) and release so it tries to apply itself on the glass again. 【Model Numbers】:Compatible with: Apple iPad Pro 9.7 2016, iPad Air 1st 2nd Gen, iPad 9.7 5th Gen 2017, iPad 9.7 6th Gen 2018. (A1474, A1475, A1476, A1566, A1567, A1673, A1674, A1675,A1822, A1823, A1893, A1954). 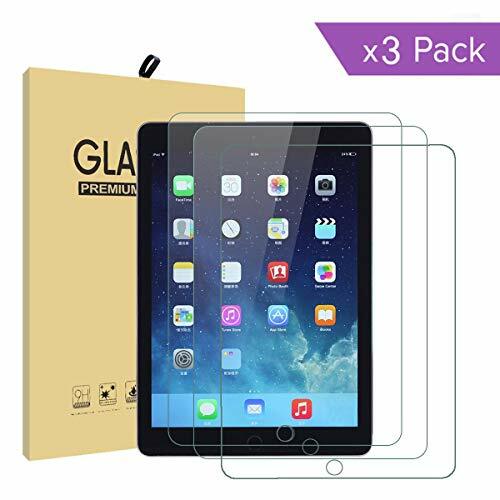 【High Quality Tempered Glass】：iPad 9.7 screen protector is made of real glass, premium thin 0.3mm 2.5D round edges ballistic tempered glass with 9H hardness and scratch- resistant. It always keep your cellphone’s screen away from scratches and drops, extremely durable. 【High-sensitivity Touch Response】：SCRATCH-RESISTANT: Made from superior 9H tempered glass that is scratch resistant and shatterproof protecting your screen from scratches to high impact drops. and protects against sweat and oil residue from fingerprints. 【Stress-Free Installation】: Bubble-Free self-adhering technology makes installing simple and efficiently. With the 9H surface hardness, the KIQ tempered glass will provide you with the highest durability and scratch resistant keeping your screen in it’s original condition. 【Includes】:3 Pack iPad 9.7 Glass Screen Protector,3 Pack Wet/Dry Wipes, Dust Removal Stickers.100% satisfaction warranty. And installation video walks through 3 steps installation.